My brain is going crazy, not that it wasn't already - just ask my husband! We are transferring in September or October...maybe. 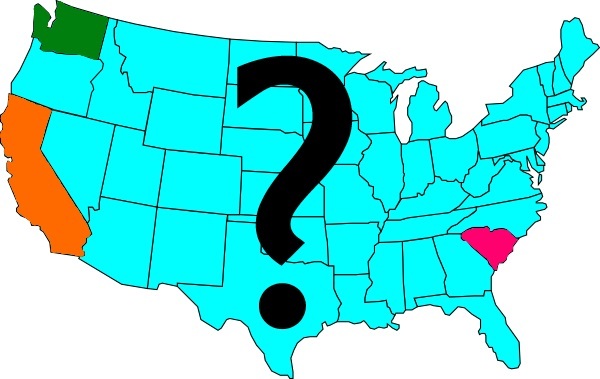 Basically, we might be staying here, going to our old home in South Carolina, or someplace totally new in San Diego! Now that it's summer, I'm under the deception of liking WA State. Normally, I hate it. So dreary, wet, and cold (in my opinion). Kiddo would like to stay here because of his friends. I like the layout and size of this home. Not to mention, it would be nice to finish some of the projects I had planned...and a slew of new ones in my head! The major downside is me having to brave 4 more years of weather I hate! I need the sun, y'all! I would also likely start homeschooling Ethan or put him in private school. I just feel like next year is the age when boys start turning into jerky delinquents, and I want my son's exposure to that minimal. Job wise, this is the #1 choice of my husband. We're talking potential multiple weekdays off and lots of home before noons! We still have our home in SC, it's just been rented out the last 4 years. I like the weather, proximity to the beach, our neighborhood has a pool, and our home is lovely (even though it's a bit smaller than our current one). I'd feel pretty comfortable allowing Ethan to continue in public school in SC. He can attend the school on base, which has phenomenal reviews and received TONS of awards. He also still knows a few kids in the neighborhood from living there before. Job wise, this is my husband's #3 choice. It's still a really good shore duty. Our neighbor had the job he would be doing, and I frequently saw him home in the earlier afternoon times. Not to mention he didn't even leave for work until I brought kiddo to school ~ around 8am. That would be a nice change compared to his schedule of leaving at 6am now! On the bright side, knowing the layout in SC means I can start decorating and planning in my head. On the down side, I can start decorating and planning in my head! 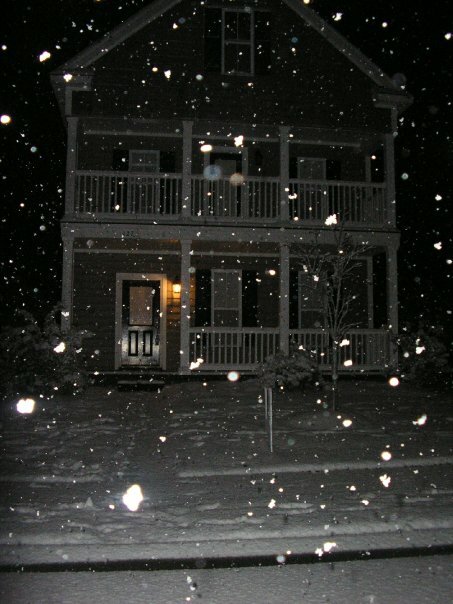 Before my decorating days...the only picture I have of our South Carolina home. You can guess why I even took the photo! On one hand, I'm trying to shift gears and only refinish pieces that I want to keep that will match my future plan for decor. On the other hand, if we sell this home it needs to look as perfect as possible. Part of me wants to sell pieces that we currently use that I can't envision a home for in SC. The other part of me knows that (for rental/resale purposes) our current house shouldn't be barren or a hodge podge of mis-matched furniture that I have plans for in our new home. And it's driving me nuts. Although, it's highly likely that we will transfer before it is sold and it will just end up completely empty anyway! But it needs to look good for pictures! Not to mention, we're not sure if we are going to sell this home or rent it. That will be determined on if and how much of a loss we will incur with the sale. I know there was a time when it was worth like $50k less than what we paid! Not interested in that much of a loss!!! AND, the rental market here seems tough. We've seen houses in our neighborhood sit empty for a few months. We've been very lucky that our home in SC has stayed rented with no lapses. Then, of course, there is the total unknown factor of San Diego! If we go there, I have no clue what our house will be like - only that we will be renting. That puts a damper on my decorating freedom. However, it will be a nice challenge to decorate within the parameters of (hopefully) white walls. Living expenses here are ridiculous! I've looked around, and we're talking homes within our $2300 ish a month budget average 1,500 square feet. Whomp whomp. I would be 100% against Ethan in public school here. So, homeschooling or Catholic school would be it for sure. That's another potential expense. Another HUGE downer - hubby would want me to stay here until we found a home within our budget in CA that we really liked. That could take a long time! I understand why. He doesn't want to live some place that's super tiny, not in a great area, or a little dumpy, and he would not want to move AGAIN once we were there if we found a better place. BUT, we'll have a 1 month old when it's time to transfer. I'm not okay with him missing any of that time when he doesn't HAVE to. There are so many projects that I want to do, but am putting on hold. For example, I want to make some curtains for our master bedroom. I have the fabric and only need a few more items. Now if we go to SC, our master there has the same number of windows as here! So, that wouldn't be a waste of time to go ahead with that project at all. BUT, if we end up in SD...we could have a master with only one window. I would just feel like I wasted time and materials if that were the case. I'm also not that motivated to work in the nursery, since that is a big question mark. Mainly with furniture size. I have a pretty large dresser set aside for her...but if we end up renting in California it's very likely that the bedrooms will be tiny. Rental homes within our budget average 1,500 square feet. Our home now is over 2,400 and the SC one is 2,000 I believe. We definitely have to downsize!!! What I should be focusing on are the projects in this home that need to be completed to sell or rent. Like, the trim in the master bedroom, bathroom, and nursery is still brown. I panted everything else white. There's some paint peeling on the trim around the doors outside that should be fixed. Our doorbell is broken, some of the toilets run, etc. Not to mention ORGANIZING! Pantry, closets, the disaster that is the garage... Sadly, none of those are FUN projects!!! Bottom line - I guess I'm just really ready to know where we are going, so I can attempt to prepare as best as possible!